It is time to LOCK your LOVE into Kinkaid! The Fantastical Fête will be here soon and the entire Kinkaid community is invited to join in on the fun with a community art project. Proceeds from this project will support special requests from faculty and staff across all departments. 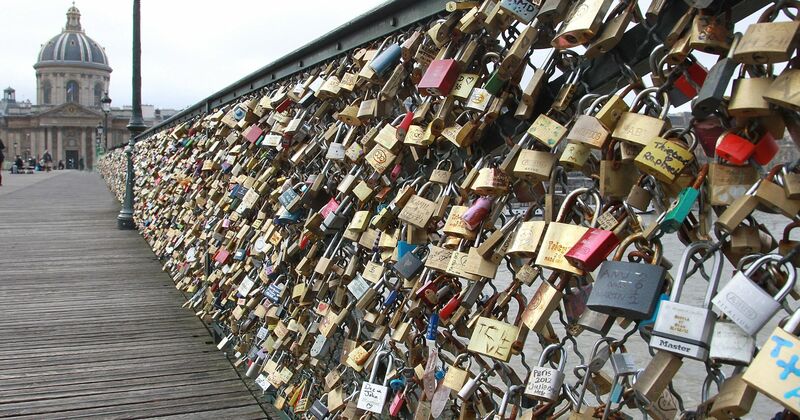 For decades, sweethearts, families and friends have been attaching locks on bridges, fences and gates to symbolize their love and appreciation for one another. The lock bridges have been popping up around the world with the most well known one being the Pont des Arts bridge in Paris. The tradition of the locks began in Serbia. Local legend holds that when two lovers were separated during World War I, the left-behind lover attached a lock to a bridge. The accumulation of locks have become works of art! The community is invited to "lock their love into Kinkaid" by locking their own personalized decorated love lock onto a fence - the fence will later be installed at the entrance to The Backyard. The Kinkaid Love Locks will be a fun way for students, families, faculty and staff to show their appreciation for Kinkaid. Purchase a lock for your child(ren), friends, family or even honor a beloved faculty or staff member. Sign up online for the community art project. There are two options for participation. 1. $25 - Bring your own decorated lock to school and place on the fence. - Locks can be purchased at any home improvement store and most pharmacies. - There are multiple sites where you can order personalized locks, here are a couple. 2. $35 - Kinkaid will provide a lock to take home, decorate and return to place on the fence. - Kinkaid provided locks will be distributed to the youngest child's locker on Monday, February 4. Now it is time to get creative. Paint it, bedazzle it, engrave it or simple put your name on it. Just have fun and enjoy making a work of art! Lock-In Days will take place during the week of Valentine's Day. Send decorated locks on the days assigned below. Students will have designated times to lock their work of art onto the fence. After all the locks are placed, the fence will be permanently installed at the entrance to the Backyard! Your love lock will be here for years to come. *Lower School students can bring their locks in anytime - each teacher will have a "lock box" to keep them safe until February 11. Current view of The Backyard. If you have any questions please contact Laura Cureton (Lower School), Missy Pitts (Middle School) or Laura Kelsey (Upper School).